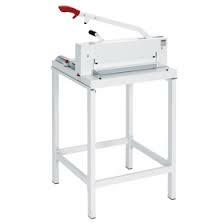 SCS™ safety features: hinged, transparent safety guard on front table with locking device for the blade lever (a cut can only be executed if the safety guard is completely closed); transparent safety cover on rear table; blade changing device covers cutting edge of blade; blade depth adjustment from outside of machine; blade and cutting stick can be changed without removing covers; safety blade lever with patented overload protection. Patented, lever-activated, fast-action clamp. Lockable back gauge. Precision side guide with measurement scale (mm / inches). High quality, German steel blade. All-metal construction. Optional stand, or cabinet with storage shelves. UL and C UL approved.